So Much Amazing Stuff ! The most common comment from new customers when visiting the shop was that we had “so much amazing stuff”. Often followed by “it would take me at least two days to look through everything”. Only now though having been through everything myself do I actually realise how much “stuff” there was. Of course we have new vinyl and CDs but then there is all the second hand vinyl and CDs as well as a small but interesting collection of DVDs. A wall of local band’s releases meant customers understandably looked for guidance to find the albums that they might like. We’ve never had too many t-shirts but customers normally found something they wanted and of course the Avalanche t-shirts were a must have for many. Magazines and books may have just been in piles on the floor but many a customer found an article on a band they had been looking for or a book they didn’t even know existed. The revelation though has been the posters. Posters were always going to be a bigger part of the plan after we moved to the Grassmarket but I never imagined how popular they would be. The badges we have are always popular but customers and in particular younger customers love the posters. They are amazing posters but there is more to it than that. In these days of searching online there is no equivalent to carefully looking through a huge pile of posters one by one never knowing what the next one will be but with the anticipation that it might be something special. We once had two families in from New York and the parents bought a selection of CDs. Their kids five in all were still looking through the posters so they went for a coffee. They returned an hour later but still the kids wanted to stay and look through more. If you don’t mind they said we’ll go and do some shopping. They returned 90 minutes later just as the kids had finally been through every poster and amassed a fair pile which their parents gladly bought explaining that the shop could double as a teenage creche as they’d had a great time wandering around “kids free” while at the same time returning to some very happy children. This scenario was repeated regularly. English parents in Edinburgh on business would go home with presents for their kids from the shop and stories of posters “you can’t find in London” and fantastic Scottish bands unheard of elsewhere. They would tell me what their children liked and I would recommend a Scottish equivalent. This was an even more common occurrence with American customers. On many occasions we actually had these customers bring their children with them while in Edinburgh on business so they could visit for themselves. Mostly it was for the posters and local bands but more and more recently for the vinyl too. You can’t find a selection like this in ………………. There is however a problem with all this. While people were buying things they didn’t even know existed or had never seen they weren’t buying the things they knew they wanted. Whether they were buying from Amazon, the bands/labels directly or the now fully stocked HMV/FOPP they definitely were no longer buying them from Avalanche. Big releases started only selling ten copies. We would cover a release with three copies and sell one or none. We might get asked for something we would like to have stocked but could easily have sold none at all so didn’t have. While we were selling hundreds of Bright Eyes albums we could afford time to promote less well known bands. While we were selling large amounts of the big selling local bands we could spend time promoting the smaller ones. However these are changed times and only the occasional release still does very well. Frightened Rabbit, Nick Cave, The National, Boards of Canada, Mogwai and of course Withered Hand all come to mind. Dead Flowers, There Will Be Fireworks and Quickbeam led the way for releases without distribution. These albums all showed how things might be they were few are often far between. So what will the new Avalanche look like ? Great as all this was it was clearly unsustainable and the break in the lease helped me make that decision. The truth is while I know the things I would like to keep nothing yet is set in stone. It will to some extent depend on where we move and also how the shop fits into the bigger jigsaw that now involves a revitalised label and the commissioning of posters and prints among other things. 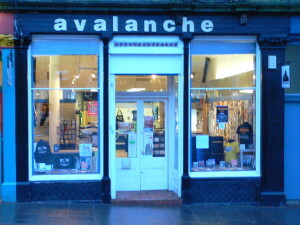 It is also clear that for a shop of Avalanche’s stature and reputation to continue it needs revenue outwith that of a stand alone retail shop and that simply selling online is not the answer. One of the few things I don’t enjoy when chatting to customers is when they tell me that their local record shop closed or maybe even worse that it is still open but “a shadow of what it used to be”. Another comment more recent is that a new shop has opened but “it is nearly all second hand and a bit disappointing”. Whenever there is change not everybody will be happy but I’m confident that whatever we do next will not disappoint.